Through movement, GymSports New Zealand will lead New Zealanders to do better, feel better, be better. The 2019 Competition season has commenced and all events are now available on the Events calendar. Coach Qualifications: Coaches whose athletes are competing at the level eligible to attend the New Zealand Gymnastics Championships must hold (at a minimum) the Elementary Coach qualification for their code in order to be on the floor or warm-up area with their athletes at qualifying competitions for the New Zealand Gymnastics Championships. AeroSchools: AeroSchools Level 5 will be the only AeroSchools Level eligible for the 2019 New Zealand Gymnastics Championships. As of 2020 no AeroSchools levels will be offered at the 2020 New Zealand Gymnastics Championships. Please note: The AeroSchools programme will still be used as a Gym for All programme and used for AIMs Games, NZ Secondary Schools as well as at club competitions if desired. When considering the GfA event pathway, AeroSchools will definitely feature as a topic in a ‘National Clubs’ style event. Rhythmic Gymnastics Level 4: From 2019, Rhythmic Gymnastics Level 4 will no longer be held at the New Zealand Gymnastics Championships. The Level 3/4 Nationals Festival Competition will be held on the 21-22nd September. 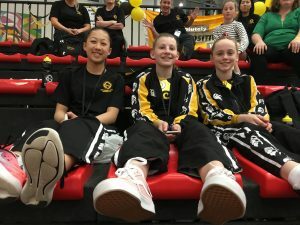 Your Gymnastics NZ Relationship Managers will be collecting contact information for the Provincial Coordinators, Team Managers and Code Coordinators for each of the provinces. Provincial Coordinators will receive all high-level communications from Gymnastics NZ via email. As a reminder, Provincial Coordinators are solely responsible for submitting the athlete and coach dispensation applications. They will not be accepted from any other source or after the closing date. Team Managers and Code Coordinators will receive information from Gymnastics NZ via Basecamp, our event communications platform. Distributed information will include athlete entry instructions, start lists, timetables, music submission link and various pre-competition forms. Invitations to join Basecamp will be sent out in the coming months. We would like to sincerely thank those that volunteer for these positions. The National Championships would not be possible without your support and dedication. Please Support the Gymnastics NZ Family of Sponsors. They support our Sport.